UC president Janet Napolitano has hired a former federal prosecutor to “investigate UC Davis Chancellor Linda Katehi for alleged nepotism and improperly spending public funds,” reports the Sacramento Business Journal. Katehi had been placed on a 90-day administrative investigatory leave a week earlier. 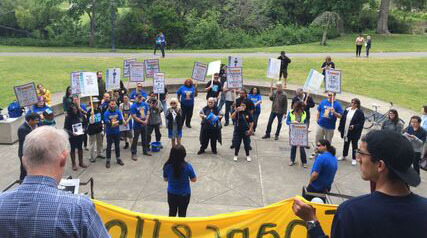 Workers at UC Berkeley rallied Thursday against campus management’s plan to lay off hundreds of workers, reports the San Jose Mercury News and the Berkeley Patch. Members of UPTE’s Local 1 joined the picket line, in solidarity with other campus unions (see photos). Nearly three dozen UCSC faculty members have signed a strong letter to UC president Janet Napolitano, calling her actions last month over a resolution on boycotting Israeli academic institutions “inappropriate,” saying she “failed to consult with your own faculty” and that Napolitano’s position could “cast a chill on academic freedom.” Faculty from UC Irvine and UCSB have also made public letters voicing similar objections, which appeared on the blog Remaking the University, and California Scholars for Academic Freedom has published a letter signed by hundreds more. California State University faculty union members voted to approve a deal to increase salaries by 10.5 percent over three years, reports the Los Angeles Times. As part of the deal, the California Faculty Association, which represents more than 26,000 faculty and staff, agreed to double the time it would take for faculty to be vested for retiree health benefits. “Sexual harassment courses aimed at preventing workplace discrimination can have the opposite effect, making men less capable of perceiving inappropriate behavior and more likely to blame victims, according to academic studies,” reports The Guardian.